The best place to begin your expedition into the peat is the Veenpark in Barger-Compascuum, not far from Emmen. 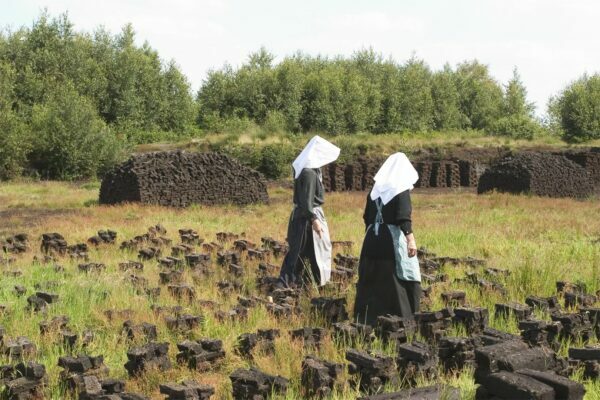 This museum tells the story of the peat moors along the Hondsrug. At the entrance to the museum is an exhibition by the Hondsrug UNESCO Global Geopark about peat, turf and the people who worked here. You can look around without buying an entry ticket for the museum itself. In the Veenpark you will see how people lived and worked here in Drenthe in the old days. Nowhere else in Drenthe can you get so close to life in the peat colonies. For example in the small houses of the pioneers from 150 years ago. Come and see how the first colonists in the nineteenth century lived in the village of ‘t Aole Compas in huts made of turf sods. Walk inside the houses in the peat colony of Bargermond. Travel on the small train to the peat fields in the nature area of Berkenrode.